Woodlands Elite Cheer Co., L.P. - STAFF	if you are not redirected in a few seconds. Ed started his cheer journey at TVCC. He went on to Lamar University, which took him into restaurant management of the Black-eyed Pea restaurant for 10 years. During this stage of his life, he still found time for tumbling, judging, and made time to work with teams! Finally, Ed made cheer his career in 1997 and never looked back. He moved to Houston and started at All- American Cheer. A few years later, he was involved in the process to start WECC. The rest is history! As Owner/Partner, Ed has had the privilege to work with all levels and was fortunate enough to win titles in each one. Now he’s excited to work with Basic Training, which is a great feeder for our all-star program. He is USASF certified in all areas! Ed’s favorite colors are red, black, and white. He has been coaching for over 20 years. His favorite foods are pot roast, and chicken and dumplings! He also loves Snickers and Sour Cherries. Ed’s hobbies are shopping, and collecting watches. His birthday is November 6th. Brian is currently an Owner/Partner of Woodlands Elite Cheer Company and is an active member of Woodlands Church! He serves in many different capacities within the United States Allstar Federation (USASF) and is currently an Executive Committee Member for the National Allstar Cheerleading Coaches Congress (NACCC). Brian will tell you that his crowning achievements were surrendering his life to Christ in 1985, marrying his wife Kristen in 2005, having their daughter Presleigh in 2008 and son Beckham in 2014. The Montgomery County Commissioner’s Court appointed Brian Barnhart to the Child Welfare Board in September 2010 and his passion to improve the lives of children within our community has become a lifestyle! Brian was born February 14th and survives on Pappasitos, Chuy's, Milk Duds, Peanut Brittle & Reeses Peanut Butter Cups! Action Movies, Water Sports, Snow Skiing and the NEWLY found Skydiving have become his extra curricular outlet! "A person's actions will tell you everything you need to know!" "Follow, Lead or get out of the way!" "Become the most POSITIVE & ENTHUSIASTIC person you know!" Kristen Barnhart coaches Flyers and Stretching Classes here at Woodlands Elite. She has been here since 2002, when Woodlands Elite first opened. She is married to Brian Barnhart and has a daughter, Presleigh, and a sweet little son, Beckham. Kristen is a former 2nd grade teacher that has a love for children. She loves watching kids grow and learn new things. She is USASF certified levels 1-5. She is also first aid and CPR certified! Kristen loves spending time with her family! She also loves gummy bears and Mexican food! Her birthday is May 10th. Tayler is the Activities Coordinator at our Oak Ridge North location. She has grown up in the program since it was founded in 2002 and considers it home! Tayler competed with Woodlands Elite for 6 years, until she graduated from The Woodlands High School in 2008. She then went on to Oklahoma State University, where she earned a Merchandising degree with minors in Marketing and Management. Tayler is your "go-to" girl when it comes to anything you may need at Woodlands Elite Oak Ridge. She loves getting to know the kids and parents, and welcomes conversation! Tayler's birthday is August 18th, but she accepts Diet Cokes all year round! Dana McBee has been a part of the Woodlands Elite Family since 2001. She has loved seeing the continued growth/expansion since the beginning when she, at one point, ran the front desk! Dana has worked in Administrative/Accounting Management for over 16 years! She was born in Austin, and grew up in Kingwood, Texas! Dana considers her biggest accomplishment to be working daily with "cheer moms" and getting through Regional cheer season. She resides in Spring, TX and recently married her long time boyfriend of 12 years. She has one dog, Sadie and is now, one day planning to have children of her own... but we will see! Ms. Dana loves Stacy's pita chips, pretzels with peanut butter and large Diet Cokes! Kevin is our All-Star Director for all 4 Woodlands Elite locations. His cheer career started in 1999. He was recruited onto his high school competition team and the rest is history. He was a Varsity Cheerleader for Kempner High School and graduated in 2000. Kevin attended Houston Baptist University, where he cheered for one year! From there he attended online college at Kaplan University and received an Associate’s Degree in Business Management. He started coaching at South West Cheer Academy, “Storm”, in 1999 and continued until 2001. Kevin has coached at Woodlands Elite since 2001! He’s coached every age of all-star Cheer from Tiny Level 1, all the way to International Coed Level 5! He’s also coached and choreographed MANY National Championship teams at all levels. He won 2 Bronze Globes at the World Championships with Generals (2009 & 2012). One of his proudest moments has been taking the first EVER Houston Level 5 NCA Championship title, winning the 2013 Small Senior division at NCA out of the 30 best teams in the country and then doing it again in 2014 and AGAIN in 2015! Back-to-back-to-back champions!! He didn't stop there though. Generals also earned a World Champion Title in the Small Senior division in 2015. Woodlands Elite's FIRST EVER! Kevin’s goal is to continue to grow our program to be one of the best, if not THE BEST, all-star cheer gym in the world! Outside of cheerleading, Kevin’s hobbies include exercising and working out regularly and playing golf whenever he gets a chance. He also enjoys wakeboarding, water sports, and watching all kinds of movies. His birthday is July 24th and he loves steak and shrimp. His favorite candies are Peanut M&Ms and gum! In 2008 Jessica graduated with a Bachelors of Arts in Journalism and Advertising at the University of Oklahoma, where she cheered for the All Girl Team 2003-2008. She has been a UCA Head Instructor, Core Staffer and College Staffer. She was also part of their international staff where she traveled to Singapore, Scotland, Australia, Columbia, Puerto Rico and Tokyo. She has been coaching all-star cheer for 11 years. This sport is not only her career, but her passion! She won the ICU worlds with Team USA All Girl in 2010. Coach Jessica carried the first ever Medium Coed 5 team, Black Ops, at WECC to an 8th place title at worlds! Her favorite foods are Mexican food and seafood! Jessica’s birthday is August 20th. Coach Jasmine started her cheer career when she was seven years old in her hometown of Lewisville, Texas. After many years in peewee cheerleading, she dedicated six years to all-star cheerleading at Cougar Cheer and Dance Company in Carrolton Texas. In 2006, Coach Jasmine made one of the BEST junior college programs in Texas, known as Navarro College. She earned two Collegiate NCA National titles, was captain for three years and graduated with an Associates Degree in Arts in Education. In 2009 Coach Jasmine transferred to Texas Tech University and was game day and leadership captain until 2012. Jasmine graduated with a Bachelor’s Degree in Interpersonal Communications. During her time at Texas Tech she was on the all girl team for Team USA and won gold in 2011. She became the University of Houston Cheer Coach in 2012 and will now be back at Woodlands Elite as our new School & Camp Director. She is SUPER excited to be back and ready to help turn our kids into great tumblers, flyers and incredible young adults. Her birthday is June 11th and her favorite color is yellow. Coach Jasmine also loves street tacos! Ashley is the Communications Coordinator for our Oak Ridge location! She began cheering at 12 years old on her middle school cheer team in her home town of Columbus, Ohio. Cheering through middle school and high school for seven years, Ashley then moved to Charlotte, North Carolina to attend the University of North Carolina at Charlotte where she graduated with a degree in Art & Graphic Design and a Minor in Communications. She began coaching all-star cheerleading the first year she moved to Charlotte in 2009 with Charlotte Extreme Cheerleading. Ashley Coached in Charlotte for 7 years and worked with all-star teams, tumbling classes, stretch classes, school camps and clinics, private lessons, and other specialized classes! She ended her time in Charlotte as the All-star Director of her program! She coached many of her teams to National Championships including two back-to-back Cheersport National Championships in 2013 and 2014. She loves meeting new athletes and parents and working with many different levels and age groups! Ashley's birthday is October 6th, she loves Gummy Bears, Hot Tamales, and is a firm believer that Coke is always better than Pepsi! Michelle grew up as a power tumbler and all around gymnast in Wichita Falls, Texas. After 11 years of gymnastics, Michelle went to The University of Science and Arts of Oklahoma in Chickasha, Oklahoma and began to find a love for cheer. After 3 years of cheering for the USAO Drovers, Michelle focused on her degree in Kinesiology, which she obtained in April 2013. Michelle has been coaching since she was 16; summers were devoted to coaching various gymnastics teams in Wichita Falls, and coaching at Bela Karolyi's Gymnastics Camp. While in Oklahoma, Michelle spent 5 years acting at assistant coach of a power tumbling team and was the head of the beginners program at Sooner Tumbling. Michelle got her start of coaching cheerleaders at Sooner Tumbling, and coached her first cheer team at Extreme Cheer and Tumble in Killeen, Texas. Her Junior 2 team came home with a national title from CGA last season. On October 12th, 2013, Michelle got married to Coach Levi Drake, and is glad she has him for support in her coaching endeavors. First off, Levi would like to say how privileged and honored he is to be part of the WE Movement. Working at this gym has been a career dream of his for as long as he can remember. Levi has been coaching for a little over 10yrs now. He started his coaching career in 2003 at C Slott gymnastics in Huntsville TX. Levi also spent 9 summers at Bela Karolyi's gymnastics camp coaching gymnastics and training other coaches. He coached at various gyms throughout Texas and did tumbling clinics across the country. Levi spent 5 years at Extreme Cheer and Tumble in Belton, where he was privileged to coach several teams, winning numerous competitions and championships. These included ACA, CGA, DCC, Cheer Power, and Spirit Celebration National Championships. He was also nominated for Spirit Celebration Coach of the Year. Levi’s proudest accomplishment to date is coaching a two time, back-to-back NCA Championship team in the Senior 4 division in 2011 and 2012. On October 12, 2013 Levi married his wonderful wife Michelle and loves having her work side by side with him here at WE. The Drakes are incredibly happy to be part of the WE family. Tara started dancing competitively when she was 3, ending her dancing career as a captain on her high school dance team her senior year. She started competitive gymnastics at age 9, competing level 9 at the State level by the end of her career at J & R Gymnastics in New Braunfels, TX. Tara went on to cheer in college in 2001 at Texas State University, transferring to the University of Kentucky in 2003. She says she was lucky enough to win a UCA College National Championship in 2004 with UK. She then returned as the captain of Texas State Co-ed in 2005. Tara graduated with a BA in History/Anthropology with an additional certification in education. During her college career she staffed camps, clinics and competitions all over the state, nation and world. Tara was privileged to work as a UCA college and international staff. Tara has been at WECC for 5 years now. She’s coached various teams from Cadets to Generals during her stint at WECC. Her favorite color is Kentucky Blue and she loves Mexican food! Her birthday is March 8th. Justin started tumbling and cheering as a kid, and began competitive cheer when he was 14 years old. He started coaching gymnastics and tumbling at Cypress Gymnastics Academy when he was 15. He is a 2003 and 2005 UCA National Champion and 2006 NCA National champion. In 2006 his team took home silver at Worlds. In 2008 he was an NCA National Champion and also coached a Senior 2 Team that won NCA. After high school, Justin went on to coach at Extreme Cheer and Dance in Lubbock, Texas for 2 years and Cheer Nation in Katy, Texas for 4 years. Justin cheered at Navarro and Sam Houston State, where he is currently finishing his degree in accounting. Justin has been USASF certified since 2007, and has been CPR and First Aid certified since 2001. Justin loves playing golf and eating candy in his spare time! Traveling all the way from Atlanta, D'Andre Williams! USASF Certified levels 1-5, he's had experience with teaching athletes from various skill levels that include back handsprings through to double whip doubles. He's an AMAZING tumbling coach and his attention to detail has allowed for remarkable results. He has positive coaching style pushing his athletes to the best of their abilities. Stressing AGGRESSIVE and POWERFUL tumbling! Matt Kelley is the proud Owner of Karma Returns Clothing and one of the most talented cheer coaches in the Houston area with over 16 years of experience. Woodlands Elite is excited to have him join our staff family! Matt started cheering at Northwest All Stars and went on to compete with Texas Lonestar Cheer from 2000 to 2003. He was a part of Team USA in 2003 and Cheer Athletics Cheetahs (L6) from 2003 to 2005. Matt also attended the University of Houston from 2003-2005 and cheered during his time there on their competitive team. He then went on to cheer at Hawaii Pacific University and was a 3x NCA Collegiate Champion. He helped Texas Lonestar Cheer Red-i Bronze at Worlds in 2011. He is funny, hardworking and puts his heart into everything he does! Brandon Pizarro started cheering as a senior in High School. He then joined the all-star gym where his High School team practiced and continued to cheer for teams such as South Jersey Storm, Maryland Twisters and Spirit Explosion. In 2013 Brandon moved to Texas to attend Navarro college. While at Navarro he cheered with Cheer Athletics Wildcats for 2 years winning 1st and 2nd place at The Cheerleading Worlds and two college national championships. He then attended Sam Houston State and won yet another college championship. Brandon has been a tumbling coach for 8 years and coed stunting for 5 years. His birthday is February 2nd and he LOVES sour candy! He's still surprised he has his teeth. 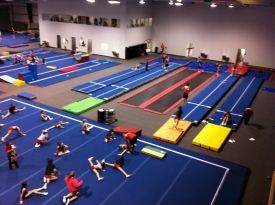 This is the first cheerleading gym Brandon has worked for in Texas and he couldn't be more excited! Sara Smith is a Tumbling Instructor and Basic Training coach who came to our WE family after moving from Northern Virginia to Texas. Sara competed with All Star Legacy for 14 years. She graduated from George Mason University, where she competed on their dance team while obtaining her Bachelor of Arts in Biology and a Minor in Dance. After graduating she pursued her dream and got to spend one month studying abroad in Europe. Sara is currently coaching while working to finish obtaining her teaching certificate. She plans to continue working at WE while teaching in the Conroe District. Her favorite candy is Starburst, which comes to a close second love behind chocolate and coffee. She is excited to continue learning about her students and growing with them. She loves to celebrate every holiday but is super excited for summer as her birthday is in July. With a gymnastics background, Logan is currently in his 6th year in the cheerleading industry. Formally the All-Star program director at Cheer Texas in Amarillo, Logan coached 8 teams from the Tiny prep level 1 division all the way through Senior level 4. He attended College at West Texas A&M where he was a track and field athlete. After working for 4 months as a missionary with an Orphanage, he knew wanted to work with kids forever. Logan’s birthday is August 14th and he loves chocolate ice cream and any outdoor activities! Christmas is his favorite holiday and he enjoys spending time with family! Logan Can’t wait to work with everyone and join the Woodlands Elite family. DON'T BE SHY, COME SAY HEY! Austin Jackson has been a competitive cheer athlete for the past 15 years. He is from a military family that has afforded him the opportunity to cheer all of the country and learn from many different and amazing coaches. Austin has been coaching since the age of 13 (junior staff) and has made it his goal to not only learn and grow as as athlete but as a coach as well. He has won numerous national titles at the Worlds level and has been to the Cheerleading World Championships 7 times ; claiming a silver and 2 bronze medals. Austin recently finished his competitive all-star career at Woodlands Elite as a Black Op - an amazing experience and one that he will treasure as THE BEST season of his career. He is very excited to begin his all-star coaching career at Woodlands Elite while pursuing his college education. Austin’s birthday is September 14th. He loves sweet tea, sour patch kids, and Cane’s!